Queen City Discovery: The Former Hopple St. Overpass Collapsed onto I-75 South. One Dead, One Injured. The Former Hopple St. Overpass Collapsed onto I-75 South. One Dead, One Injured. 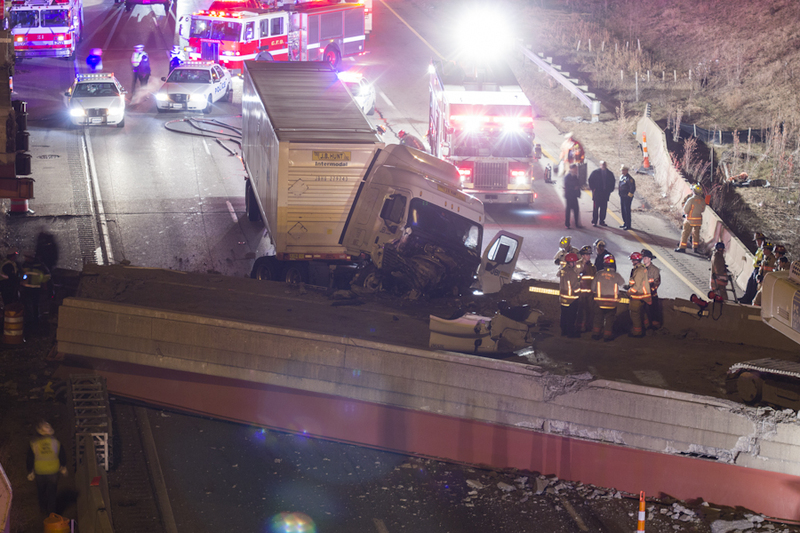 Around 11 PM on Monday, January 19, 2015, the former northbound overpass/exit ramp at Hopple Street collapsed onto Interstate 75 in Cincinnati, Ohio. 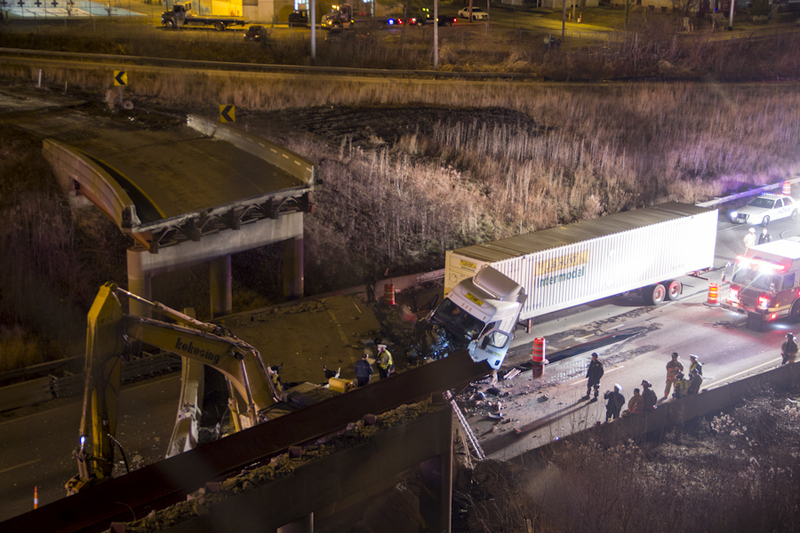 The disused overpass was in the process of being removed when the incident occurred. 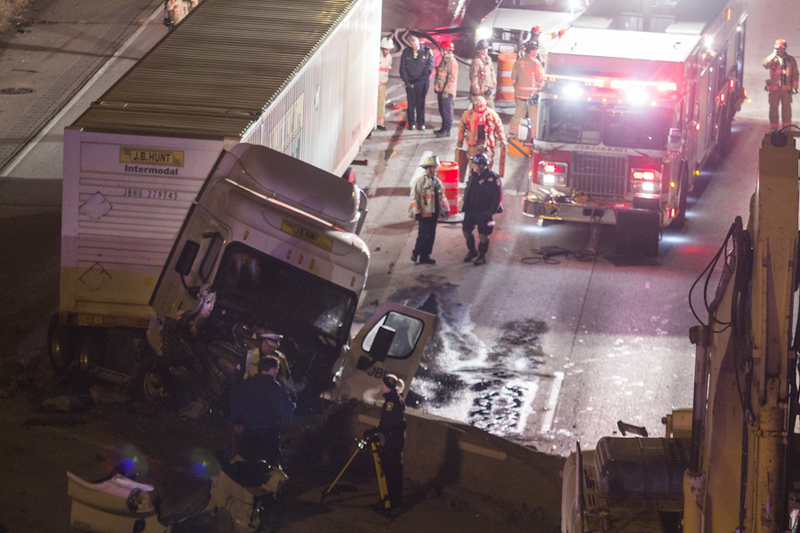 As of 1:51 AM on January 20th, 2015, local media has reported the fatality of one construction worker and the injury of a truck driver whose vehicle is seen in the above images. 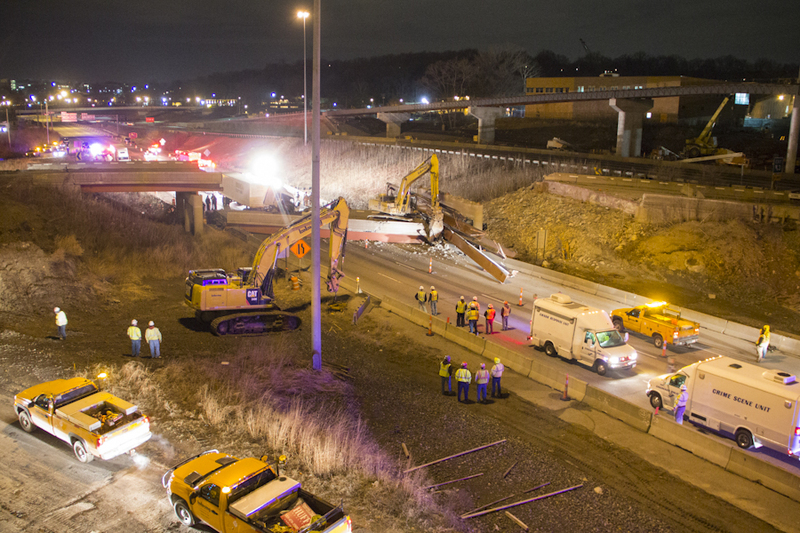 At the time of collapse, an excavator was operating on the overpass. On the morning of January 20th, 2015, the name of the construction worker was released: Brandon Carl, 35, of Augusta, KY. Carl is survived by his fiancé and their four children. 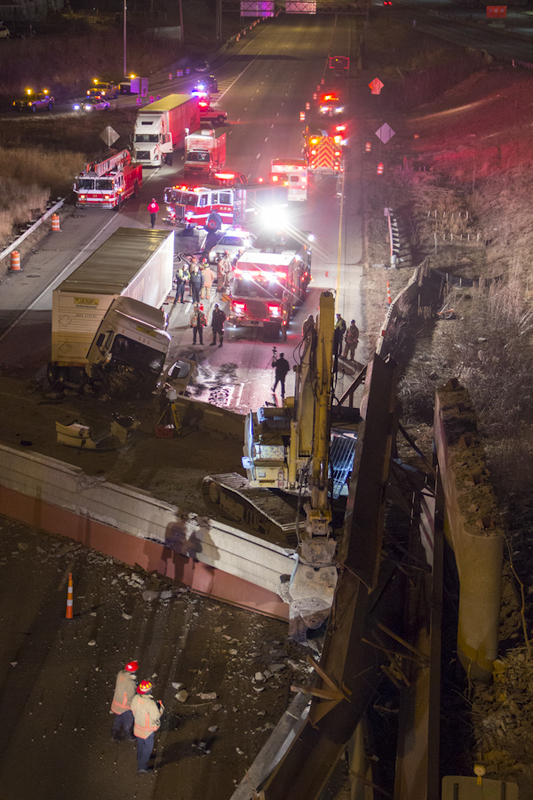 On February 10, 2015, the parents of the deceased construction worker filed a lawsuit against the Ohio Department of Transportation. On February 14, 2015, contractor Kokosing Construction Company Inc. released a statement saying that "an engineering mistake may have been a contributing factor to the collapse of the bridge." The statement followed the company's own internal investigation. On July 15, 2015, OSHA cited Kokosing for the accident, proposing up to $14,000 in fines. A confidential settlement was released and Kokosing agreed to use the services of a third party engineering firm for the next several years to review any future demolition plans. In March 2016, Kokosing had racked up over $1 Million in penalties owed to the State of Ohio for cleaning up the collapse, but had yet to pay. The Cincinnati Enquirer detailed the story. A lawsuit on behalf of the deceased construction worker's family is still ongoing. - Police officers, firemen and construction workers survey the scene. The driver of the above truck survived the incident with injuries. 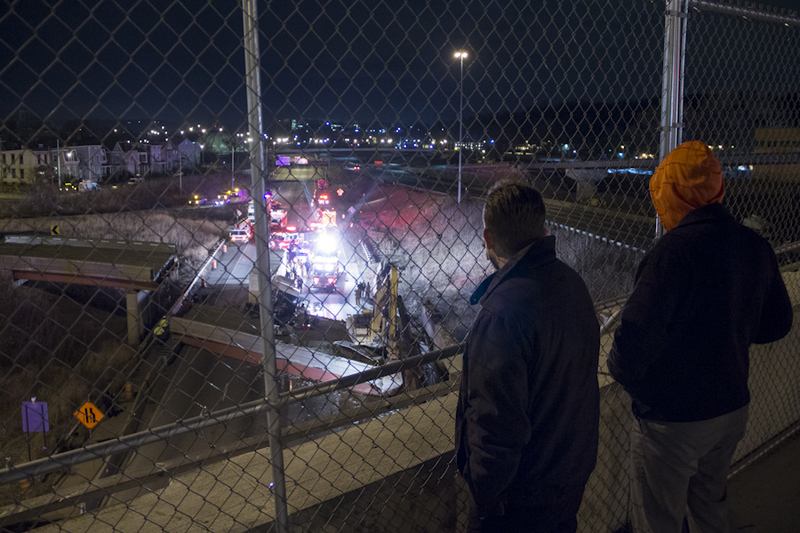 - John and Kyle (last names not provided) survey the aftermath of the incident from the street above Interstate 75. - Police officers, firemen and construction workers survey the scene. The driver of the above truck survived the incident with injuries, the fatality of a construction worker has been reported. 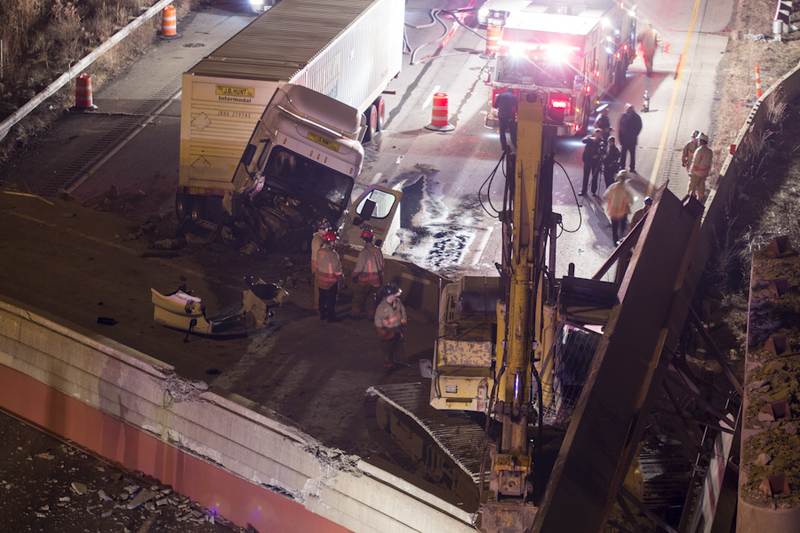 - The excavator seen above was operating on the overpass at the time of it's collapse.